Our utility provider EWEB will be replacing electric meters for Photo Voltaic and generation systems at the Student Rec Center, Central Power Station and River Pump. The outage will be less than 2 minutes. This is scheduled to take place sometime between 6am and 8am on 4/17. 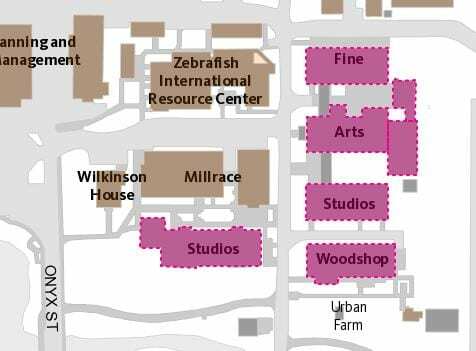 As part of the utility rerouting work for the Black Cultural Center project, EWEB will shut down power on Wednesday, April 3, 2019, from 9:00 am – 3:00 pm in the below listed buildings. For questions or concerns, please contact CPFM Design and Construction Owners Rep Martina Oxoby at 541-346-5880. All power will be shut down to replace a fused bucket in the main distribution panel at Knight Law on Monday, March 25 from 6:00 am – 8:00 am. This will impact the entire building including elevators. We have chosen early in the morning to limit the impact to building occupants. This outage was coordinated with Clarence Young, Knight Law Facilities Manager. Please let CPFM Facilities Services Electrical Supervisor Rob Berg 541-346-2313 know as soon as possible if there are any concerns regarding this electrical shutdown. Information Services has a project in Miller Theater that requires an electrical shutdown January 4 from 7:00 am – 9: 00 am. The electrical panel that will be temporarily shut down impacts rooms 150, 153, 158, 160, control room, and mechanical equipment. Services impacted: network equipment, air handlers, spotlight, EWH-1, receptacles in rooms 150, 153, 158 and 160, building automation systems, cover heaters, exhaust fans, TU-1-01 and stairway heater. Facilities will be monitoring the building systems to ensure they restore. For questions or concerns please contact UO Information Services Eric Fullar at efullar@uoregon.edu 541-346-1015. Information Services has a project in the Knight Library that requires an electrical shutdown December 26 from 7:00 am – 9: 00 am. Electrical panel 62A will be temporarily shut down. This will impact the 5th-floor mechanical penthouse; Room 521 and mechanical equipment served by this panel. Information Services has a project in Prince Lucien Campbell Hall that requires an electrical shutdown December 27 from 6:00 am – 8: 00 am. Electrical panel 4B will be temporarily shutdown. This will impact 4th-floor rooms; 470,471,472,473,474,475,446,447,444,445,443,402,403,404,405,408,441,477,478,476,477,478,405,406,470,407,441,431 & 448. Services impacted: lighting, receptacles, door holds and A/C units. There will be a power shutdown at Bean Hall on December 18 from 6:00 am – 5:00 pm. Oregon Electric Group will be installing electrical metering in the main switchgear. Normal power has been restored to Pacific Hall, Columbia Hall and Cascade Annex. All building systems are operational, and crews will be performing the following activities throughout the day. 3rd Floor: 1:00 p.m. to 3:00 p.m.
2nd Floor: 3:00 p.m. to 5:00 p.m.
1st Floor: 5:00 p.m. to 7:00 p.m.
LL Floor: 5:00 p.m. to 7:00 p.m.
Cascade Annex: 5:00 p.m. to 7:00 p.m.
Columbia Hall: 5:00 p.m. to 7:00 p.m.
Data Closets in Pacific & Columbia Hall: 5:00 p.m. to 6:00 p.m. This activity will cause a 20 minute outage while the system re-boots. Activities are underway for the Planned Full Building Power Outage that will occur from 6:00 p.m. Friday, January 18th to 12:00 p.m. Saturday, January 19th. During the shutdown, equipment connected to standby power will remain operational. Critical equipment that is not on standby power has been identified and marked, and will be placed on temporary generator power for the duration of the power outage. If you have critical equipment that is not marked with tape, please contact the staff listed below. 3rd Floor: 6:00 a.m. to 11:00 a.m.
2nd Floor: 9:00 a.m. to 1:00 p.m.
1st Floor: 11:00 a.m. to 2:00 p.m.
LL Floor: 12:00 p.m. to 3:00 p.m.
Cascade Annex: 12:00 p.m. to 3:00 p.m.
Columbia Hall: 12:00 p.m. to 3:00 p.m.
Data Closets in Pacific & Columbia Hall: 3:00 p.m. to 4:00 p.m. This activity will cause a 20 minute outage while the system re-boots. 6:00 p.m. Pacific Hall building access will be limited to the South stairwell. There will be a communication radio at each landing to contact the floor monitor for access. 9:00 a.m. Standby power will be transferred back to normal operation. No loss of power will occur. During the scheduled shutdown, the contractor will have staff walking the spaces to ensure there is no interruption of temporary power, and all equipment is functioning. They will provide temporary barriers to seal Pacific from adjoining building access, and monitor exterior doors. Preparations continue for the Planned Full Building Power Outage that will occur from 6:00 p.m. Friday, January 18th to 12:00 p.m. Saturday, January 19th for replacement of the Pacific Hall transformer. The contractor and CPFM staff have been meeting with occupants to survey and mark equipment that must remain operational during the shutdown. Standby power will remain on during the shutdown. Identified critical equipment that is not on standby power will be placed on temporary generator power for the duration of the power outage. Cooling will also be provided for the minus 80 freezer, Room 17. Preparation activities will begin Monday, January 14th and will include generator staging on the west side of Pacific and setting temporary power cables in the building. We will be preparing the transformer pad for removal of the existing equipment and for placement of the new transformer. This activity will be performed on the roof of Pacific and will create noise, so will be scheduled for early morning hours. There will be a town hall meeting Friday, January 11 at 10:00 a.m. in Pacific 318 to discuss the shutdown and answer any questions and concerns. Below are key dates and times for next week’s activities. o Temporary generators will be placed on the west side of Pacific. o 4:00 a.m. to 8:00 a.m. Start preparing transformer on Pacific roof for removal. This will cause noise on the roof and 3rd floor, and is currently scheduled for Monday – Thursday. o 7:00 a.m. The building standby system will transfer to main campus standby power. § There will be a 6 to 10 second outage during the switchover for all equipment connected to standby power. o The contractor will be bringing temporary power cables and power distribution into the building and routing them in the hallways and overhead. This will create periodic disruptive activity. o 6:00 a.m. The contractor will begin connecting equipment to temporary generator power. o 6:00 p.m. Main building power will be shut down. o 7:00 p.m. to 10:00 p.m. The transformer will be removed by crane and the new one set in place. o Parking lot 12A will be closed for crane activities. o 6:00 a.m. to 12:00 p.m. The contractor will be connecting the new transformer. o 12:00 p.m. Main building power will be restored. o 1:00 p.m. to 7:00 p.m. The contractor will be disconnecting equipment from temporary power and connecting into main power. o 8:00 p.m. Work complete. o Standby power will be transferred back to normal operation. No loss of power will occur. Monday, December 17th through Wednesday December 19th, CPFM and Andersen Construction staff will be surveying equipment in the labs and other critical spaces in Pacific Hall, Cascade Annex and Columbia. The purpose is to prepare for the upcoming power outage scheduled for the evening of January 18th through the 19th for the building electrical transformer replacement. 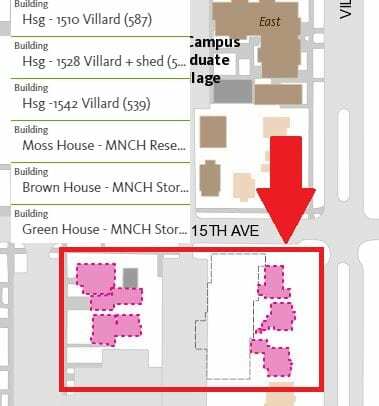 Staff will be speaking with researchers and other building occupants to confirm; which critical equipment is on standby power, any additional critical equipment that will need to remain operational during the outage, equipment power requirements, and the primary/secondary point of contact for each lab. We will be providing updates and timelines as we move closer to the shutdown date. More information will be communicated as the plan develops through various communication outlets. This notification has only been sent to primary building occupants. Please share where appropriate. 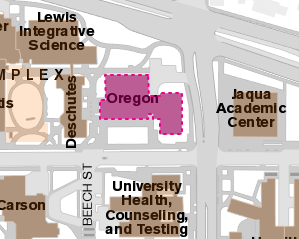 Two-day intermittent power outage across the UO Campus Winter Break. CPFM Utilities and Energy and CPFM Facilities Services is scheduling two-day intermittent power outage across the entire UO Campus over Winter Break. These will be random temporary power outages as electrical equipment is tested and exercised. This is necessary due to required National Fire Protection Association (NFPA) testing, arc flash studies, breaker recall replacements, and new buildings coming online that need to be tested and exercised. Earlier in the break was selected allowing contingency for possible downtime due to identified repairs or failures. The date needs to be selected by August 1, 2018, to allow for contractor coordination. Please let CPFM Utilities and Energy Electrical Supervisor Rick Tabor 541-346-7511 know if you have any concerns with either of these possible dates. On Tuesday, October 30 from 3:00 am – 8:00 am contractors will shut down power that services the second floor of Klamath Hall. The work is required to bring additional power into the Media Kitchen for the new Autoclave being installed. This work is part of Capital Project CP17-131 – Klamath Autoclave Install. Systems on the 2nd floor that will be impacted are non-emergency lighting, electrical outlets, network services, and dedicated HVAC equipment in some of the spaces listed above. Testing of building electrical grounding will occur on Friday, October 19 from 11:00 AM to 5:00 PM. This testing is to gather conductivity readings of the existing electrical grounding system. Testing will occur in the electrical room and north exterior of the building. There will be no impact to building users. On October 23, 2018, from 6 am – 7 am Utilities and Energy will be performing electrical vault maintenance at Prince Lucien Campbell Hall. This work will only impact standby power and buildings users will not be affected unless the campus experiences a normal feeder power outage during this time. For questions or concerns please contact CPFM Utilities and Energy Electrical Supervisor Rick Tabor at 541-346-7511. Due to conflicts with research activities the power outage has been postponed with a tentative date of January 18 – 19, 2019. 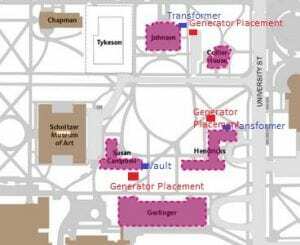 During winter break it is necessary for Campus Planning and Facilities Management to replace a failing transformer that services Pacific Hall and Columbia Hall. The transformer has failed three oil sampling tests showing contaminates during routine inspections. The conclusion is that the transformer must be replaced. This will require a normal power outage on an upcoming Saturday during winter break. Standby power will not be affected. We are proposing Saturday, December 15th, 2018 to limit the impact to the building occupants. Design and Construction will be contacting each building group to review the planned shutdown and specific considerations for each space. As a part of the Hayward Utility Corridor Project, there will a normal power and standby power outage to install new campus power cables. The Standby Power outage will NOT affect any building users, as it is not the primary source of building power. This work will occur on Wednesday, September 5 from 5:00 AM to approximately 5:20 AM. We recommend that all electronic devices be turned off before leaving on Tuesday. All building power to Walton Hall will be turned off Wednesday, September 5 from 5:00 AM to 7:00 AM. This building outage will only affect Walton Hall. We recommend that all electronic devices be turned off before leaving on Tuesday. The work will be performed by a contractor. Please contact CPFM Project Manager Jana Gerow 541-346-8317 office 970-640-0176 cell with any questions or concerns. At part of the Knight Law 384 renovations on September 13 & 14, 2018 the CPFM Electrical Shop will have the south end of the third-floor library receptacles temporarily shut down from 7 am – 3 pm each day. For questions or concerns please contact CPFM Electrical Supervisor Rob Berg at 541-346-2313. Due to adding communications equipment to roof top electrical panels at LISB, it is necessary to shut down electrical panel PN1-2 for a period of two hours on Thursday, August 23, 2018. The project manager selected 7:00 am – 9:00 am. EF-6 – Exhaust Fan for the elevator equipment room. EF-7 – Exhaust fan for the elevator chase. The lights and convenience receptacle for the indoor air handling units located in the penthouse. Miscellaneous convenience receptacles in the penthouse which are currently not in use. Impacts to building will be minimal. This will not impact elevator services but yous may experience decreased airflow in the elevator. For questions or concerns please contact CPFM Design and Construction Project Manager Jana Gerow at 541-346-8317 office 970-640-0176 cell. As a part of the CPS cabling replacement project, to improve the electrical cable from vaults between 13th and 15th avenues, west of University Street, there are plans to have five buildings serviced by Generators for 2 weeks (August 23 – September 10) while old cables are pulled out and new ones put in place. To set up the generators at the start and remove the buildings from generator power at the end, it will mean that all five buildings will lose normal power for 3 hours on two different Saturdays 2 weeks apart. Having reviewed best dates with UO schedules, our contractors and Johnson Hall – August 25 and September 8, both Saturdays, will be the best remaining days before Students return for fall semester. The Project Manager is planning around these dates unless building occupants respond to the project manager by 12:00 (noon) Monday, August 20, 2018 that this planned outage would impact an event or issue that CPFM could not accommodate. 3 Generators will be running continually, for the two weeks between these 2 Saturdays, and contractors will be monitoring fuel levels as much as every 36 hours to fuel them. This will require contractor access during working hours in the vaults between impacted buildings. Generators will be brought on site two days before the shutdown and removed within two days after the shutdown. To service Hendricks – the generator will be in a grassy area or on a sidewalk to the north of the building. To service Gerlinger and Susan Campbell the generator will be located on the grass or sidewalk between the two buildings. Again, after coordination, the Project Manager believes that August 25 and September 8, both Saturdays, will be the best remaining days before Students return for fall semester. Please respond by 12:00 (noon) Monday August 20, 2018 with questions or concerns. As part of the Oregon Hall ATS (Automatic Transfer Switch) replacement project, there will be a shut down of all POWER to the building from 6 a.m. to 7:00 a.m. on Friday, August 24 while cables are connected to a generator for the ATS equipment. When the work is complete and tested, sometime between 8 and 5 pm on Saturday, August 25, there will be another 3 hours shut down of ALL BUILDING POWER, while the generator is disconnected and the work is tested. During this approximate 36 hour time, there will be two generators located in the loading dock area. The basement equipment room 5A is the location of the majority of the work and adjacent IT rooms. All work is being done in the basement and equipment will be stored on the loading dock. Please contact CPFM Project Managers Jana Gerow 541-346-8317 office 970-640-0176 cell and Rick Tabor 541-346-7511 with any questions or concerns. CPFM Utilities and Energy will be temporarily shutting down the power to Esslinger while Electrical System Control Technicians install meter monitoring equipment. This will be a building-wide outage. For questions or concerns please contact CPFM Utilities and Energy Electrical Supervisor Rick Tabor at 541-346 -7511. This is an advisory notice of a second shutdown planned to effect five buildings in late August. This shut down is the second of two needed in order to replace deteriorating Medium Voltage Cables from Electrical Vaults 302 to 303 and to Vault 3. This cable replacement is making it necessary to shutdown all power to five buildings, both at the start of the project and at completion. The date for the second shutdown is August 21, 2018, 9:00 am to 3:00 pm. NOTE: CPFM is working to provide generator power to one building; Straub, to keep the building on full power. More details and confirmation regarding Straubs back up power will be provided as soon as available. For questions or concerns please contact CPFM Design and Construction Project Manager Jana Gerow at 541-346-8317 or 970-640-0176. Our Utility Provider EWEB has asked CPFM to contact Building Occupants regarding Utility Power Pole work that will be impacting Fine Arts and Millrace 1 on July 11 from 5:00 pm – 8:00 pm. As part of an electrical upgrade to the building to support new equipment, it is necessary to have a series of three temporary power outages July 11 – 13, 2018 in PLC. These will be from 6:00 am – 7:00 am each day. We have chosen early in the morning each day to limit the impact to building occupants. CPFM Facilities Services Electricians will be installing new breakers in the building electrical panels. Please let CPFM Facilities Services Electrical Supervisor Rob Berg know as soon as possible if there are any concerns regarding this electrical shutdown. As part of renovations, contractors are shutting down electrical power to Bean Hall East and West July 9 – 24, 2018 to allow for replacement of transformers, and cut-over to new switch-gear. The impact will be minimal since Bean Hall East and West is vacant and currently under construction. For questions or concerns please contact CPFM Design and Construction Project Manager George Bleekman at 541-346-2625. 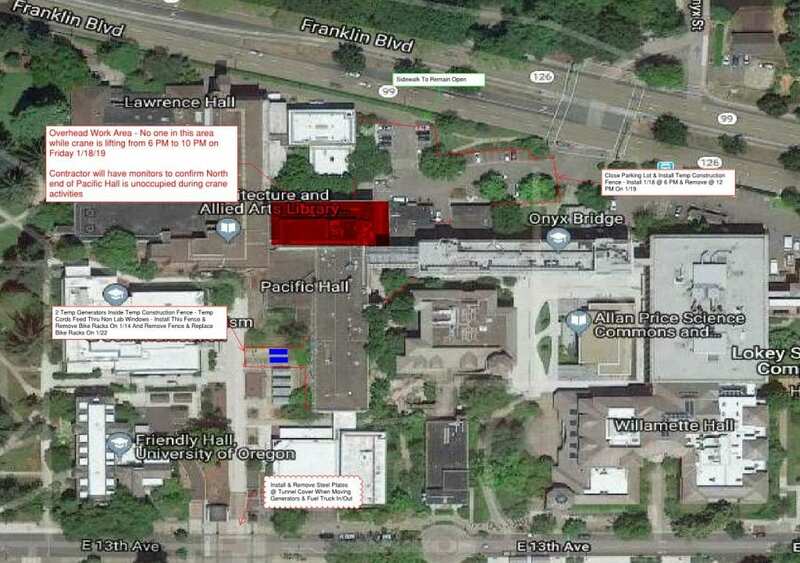 As part of the Oregon Hall Renovations on Saturday, May 19, 2018, from 6:00 am – 3:30 pm contractors will be shutting down the 800A breaker in the Basement MDA Panel Labeled West Power/Lights. This will impact lights, receptacles, and mechanical equipment that services the west portion of the building and network equipment in Room 225. The Building Network system will be down, except for areas served by East Wing data rooms. West side lighting, receptacles, mechanical equipment and the network will all be shut down during this time. This work is necessary to allow for re-circuiting lights, receptacles and power to network equipment. For questions or concerns please contact CPFM Design and Construction Owners Rep Patrick Mucker at 541-346-8216.